Flat Iron, Soho - Daisy Chains. My friend Tiffanie visiting meant that I had no excuse not to try new places out. I've been meaning to try out Flat Iron for awhile now but could never find the time to go out there and try it out, especially me being lazy and hearing stories of the long lines and waiting times to get a seat in restaurant. To our surprise, when we headed down about 8pm there was no line at all but we were informed by the front of house that there was a 40 minute wait for a table for two. Fortunately, we didn't have to queue outside the restaurant as they have a text notification system that sends you a link to your phone where you can view your position in the line and get a text for when your table is ready. Ordering in the restaurant is quite a straightforward task as there are few items on the menu. The main attraction being the Flat Iron steak with a side of salad at an affordable £10. The restaurant also offers another option of a special that changes daily and a selection of different sides that you can order with your meal. 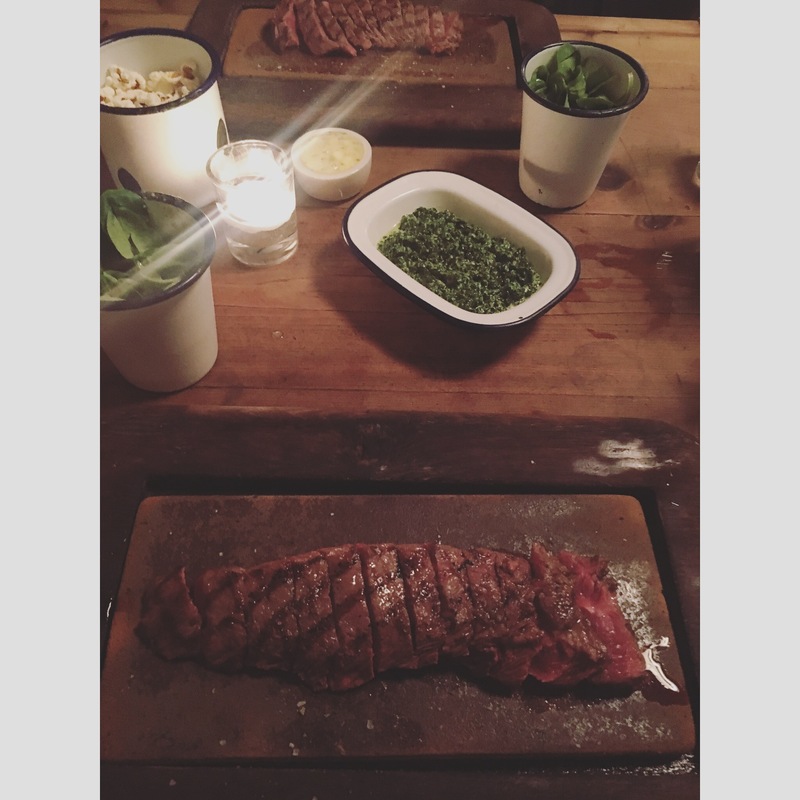 Tiffanie and I went for the standard flat iron steak and a side of creamed spinach that was priced at £3. The steaks were served medium- rare and were not one bit dry or overcooked, as promised they were 100% medium rare and juicy. The creamed spinach was absolutely delightful, probably one of the best spinach dish I have ever sampled in my life! The single £3 portion was enough for both me and Tiffanie to split between us and was so good, I didn't need steak sauce with my steak as the spinach did the job of adding more flavour to the meal anyways. After taking my time to eat the steak, I was super full and simply couldn't even think about ordering a dessert. I'm not quite sure if it is a permanent item on their menu, but Tiffanie ordered the Salted caramel mousse. 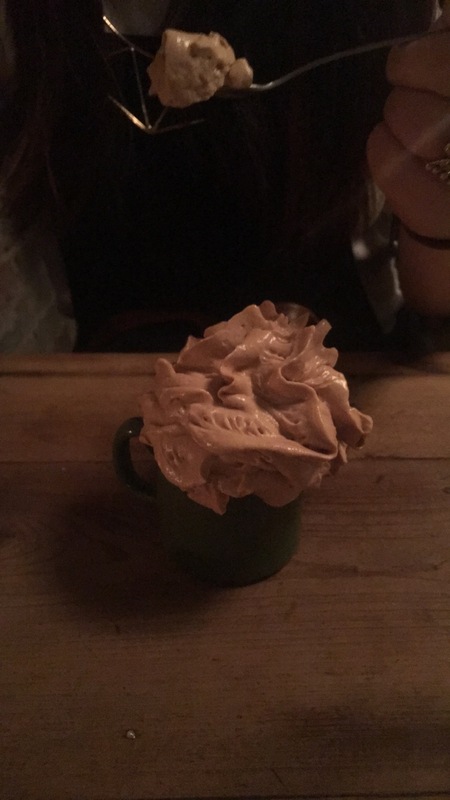 I probably was really tired at the time, but it just surprised me when a waiter walked over and placed a mug down on the table and pulled out a can of what I thought was just whipped cream that turned out to be caramel mousse. What I found super cool though was the fact that you could adjust the amount of salt you wanted in the 'salted' caramel mousse as it was not pre-mixed. Instead they gave you a little bowl of salt for you mix it yourself. Admittedly, I did have a sample of the dessert and wow, it was fantastic. I actually wish I had not been too full to have ordered my own, so hopefully next time if it is still there. Overall, my trip to Flat Iron for dinner was enjoyable and well worth the money. It's not common that you come across good steak for such a low price and thus this is definitely somewhere I'd recommend and will be going back to.